If you were asked to name the biggest possible animal it would have to live in water - and indeed this shy and graceful, blue-grey monster has never been exceeded in mass, or length; the blue whale is the biggest animal that has ever lived. Its long, streamlined shape leaves the head only taking up 25% of the length, but the dorsal fin is only one foot high. If you see a forty foot (12 m) "blow" from a whale, only the blue whale could exhale such a blast. The baleen is black, compared to a lighter coloration in the fin whale, which serves to identify the rare blue whale standings. Strange selectivity marks the blue whale diet. They normally eat only krill, whereas most whales are much less selective. The krill live in brightly lit water down to 40m deep and the whale can consume 4 million a day in the Antarctic season. When the krill disappear, the population migrates towards the equator and seem to fast for the season. 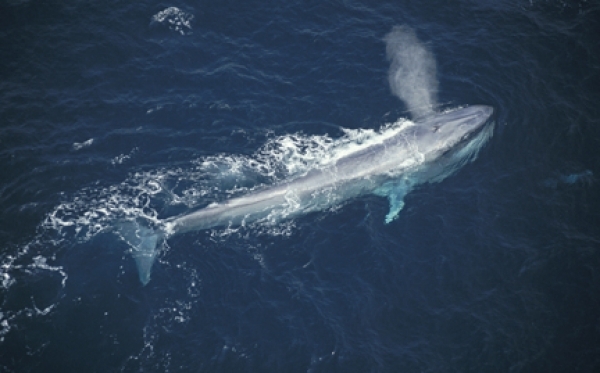 Smaller blue whale populations remain in the north Pacific, north Atlantic and Indian Oceans. Three or four form the normal pod size which must be a close knit family. At the peak of whaling in 1930/31, 30,000 blue whales (99% of the population) were killed and the species has never recovered. Recently, Some scientists have raised hopes that the slow-breeding animal is slowly increasing in one or two populations. Being rarely photographed however, and never studied in depth, the estimates have to be based on indirect counts. Increase in population since some illegal Russian whaling in the 1970s is said to be 7.3% pa.
Born at 8 m and weighing 3 tons, its mother's milk gains it 90kg per day for the first year. 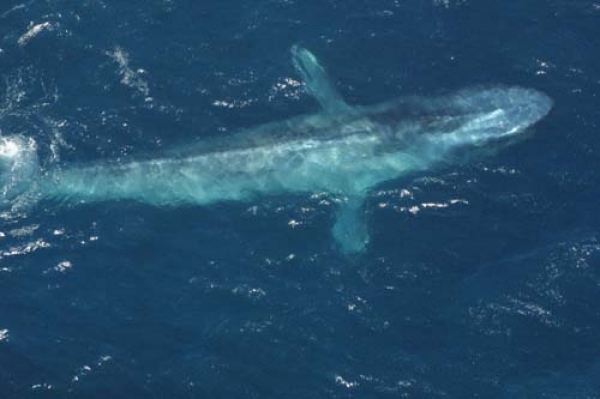 The blue whale also breaks records for life-span, living, it is thought, for 110 years. To prove this we will have to age the young born in the 1930s but scientists do estimate that blue whales live for at least 80 years.